The real yard as shown in 78/142 used as a basis for a American HO layout. A result of 'Armchair Modelling' 72/481 is this simple shunting layout-and more, capable of use in OO/HO and On 16. 5. 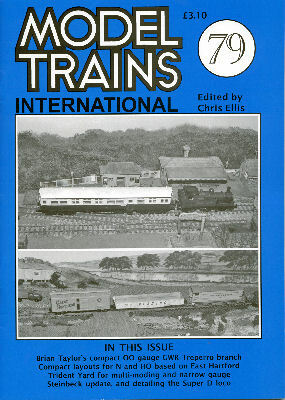 Typical action described on this HO layout based on one built 50 years ago. An occasional look at recommended models and how they fare in service, this time the Hornby Class 31, Proto 2000 EMD switchers, and Athearn EMD SW7 switchers. From the Isle of Portland, Dorset in OO a classic track plan for a small branch terminus, plus an Inglenook yard with a difference. The new Bachmann OO Class G2a 0-8-0 embellished and weathered, with photos of the finished model and prototype, includes similar work on the Bachmann 4MT 4-6-0. How a small old American HO layout was brought out of storage, improved and put into use again. Two HO layout designs for a larger areas of say 12'x8' with an American switching theme-see also 80/208.